Resilience and durability. 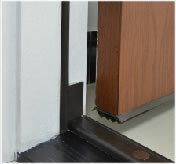 The weatherstrip provides the seal at the edge of the door and makes contact between the door when it is closed. The memory of the weatherstrip is crucial so that when the door is opened the weatherstrip springs back open and still functions when the door is closed again. Weatherstrip with poor memory will crumble and bend so that it becomes ineffective causing leaks up the side of the door and into the home. Worldwide weatherstrip creates consistent compression every time, providing a long-lasting seal and protection against air and water infiltration. Our corner pad to provide a seal against drafts, dust and water. These vinyl-coated foam wedges measure 1-1/2 inch wide and 1-3/4 inch high and feature a self-sticking design.